We hear a lot about NOAA these days, the infamous National Oceanic Atmospheric Administration. It’s NOAA that has regulatory abilities to enforce commerce based, environmental protection laws. However, there is another side to NOAA, one that is far more exciting. 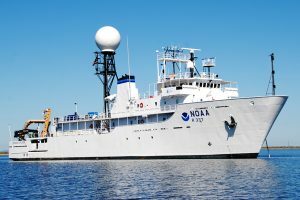 NOAA commands the only federally funded ship, systematically assigned to explore the world’s oceans. 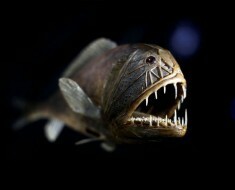 The Okeanos Explorer, is known as America’s Ship for Ocean Exploration. In reality, the Okeanos belongs to you and me, as it’s an entirely tax payer funded venture. At 224 feet long, and 43 feet wide, the Okeanos is a behemoth of ocean exploration, and is a former Naval surveillance ship. Today, the Okeanos is equipped with the latest underwater exploration technology, including two ROVs (remote operated vehicles) which are capable of making dives down to 6,000 meters. Perhaps the most exciting part about Okeanos worldwide scientific mission, is that all of Okeanos’ findings are shared live, with the general public. The Okeanos Explorer: The ship was commissioned in August of 2008, and for the past nearly eight years, has been traveling the world’s oceans, trying to unravel the mystery within 95% of unexplored watery terrain. 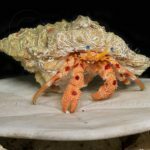 It’s been throughout Indonesia’s famous “Coral Triangle,” studied benthic environments in the Galapagos islands, and mapped the geology around hydrothermal vent life, living on the Cayman Rise within the Caribbean Sea. In addition to gathering new information about a host of ocean environments, the Okeanos team hopes to set the stage for future exploration. The ship is operated by NOAA’s commissioned officers, along with a civilian team from NOAA’s office of Marine and Aviation. 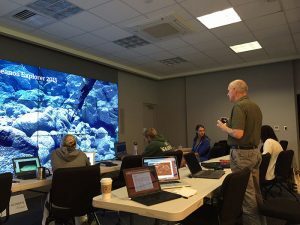 What makes the Okeanos’ mission so unique, is instead of cramming the ship wall to wall with scientists, most of the science teams studying Okeanos’ data, do so from land. The use of telepresence technology, along with live seafloor images, along with scientific data flowing over high speed internet, Okeanos’ findings are open to an entire world of scientific minds. Some have called Okeanos’ mission the most ambitious ocean exploration expedition to date. 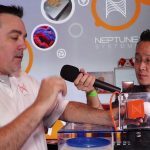 A host of scientists are on call, in the event a sudden discovery is made, or to witness previously unexplored oceanic hot spots for the first time. Dr. Robert Ballard, of the Institute for Exploration, pioneered telepresence technology, in an effort to bring more and more scientific minds into the fold of extreme exploration. 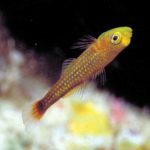 The reality is that uprooting from family life, and heading out on what seems like an endless expedition, is impossible for many scientists, as is leaving detailed research for a life at sea. With telepresence, the world’s ocean scientists can collaborate on a massive scale, fleshing out the weight of new discoveries. A hypothesis generator: The Okeanos Explorer is considered a, “hypothesis generating ship.” Also known as, “a ship of discovery.” If the ship detects a “high interest anomaly” it immediately stops, contacts its scientific counterparts on land, and deploys ROVs, along with other sensors and systems. Together with science teams on land, the Okeanos’ crew conducts site investigations, with the aid of oceanic scientists. The goal is to generate hypothesis about the inner-workings of ocean geology, biology, while gathering information about the oceanic effects of climate change. In addition to generating hypothesis, the Okeanos Explorer is a path-finding ship, paving a route of data for future investigations, and explorations. Hull mounted multi-beam sonar creates detailed 3D maps of the seafloor, down to 6,000 meters. Not only can these maps identify areas of interest on the seafloor, they also serve as a guide when piloting ROVs at depth. Mounted atop the ship is an imposing satellite dome, part of a high bandwidth satellite connection, which provides broadband connection speeds from anywhere on the ocean, up to 21 MB/s download and 4 MB/s upload, fast enough to allow real-time transmission of HD videos. Okeanos deploys tethered ROVs, capable of operating at depths up to 6,000 meters. One ROV remains suspended above the other, serving only to illuminate the dark depths. 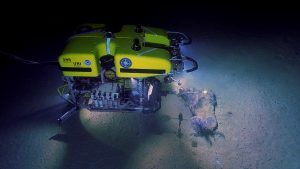 The primary ROV is equipped with dual HD cameras, and a host of sensors that collect environmental data. Alone, it’s also equipped with multiple high-output lighting arrays. The secondary ROV has a unique lighting array, made up of LED lights connected to 4 swing arm actuators. This allows lighting to be adjusted on the fly, to provide optimal conditions for taking HD video. Okeanos is equipped with Dynamic Ship Positioning, which is a GPS powered system, functioning like an auto-pilot for oceanic ships. When ROVs are deployed, the DSP automatically keeps the ship in rescue range of the underwater ROVs, taking the guesswork out of pacing the ship with the remote vehicles, and also limiting the chances that ROVs will be lost when breaching the water’s surface in adverse conditions. Land based command centers: The use of high tech, broadband communication technology, turns the Okeanos into a floating laboratory with open access to scientific professionals the world over. Command centers include the Inner Space Center at the University of Rhode Island, the Joint Hydrography Center at the University of New Hampshire, NOAA’s own Pacific Marine Environmental Lab in Seattle, Washington, NOAA’s science center in Silver Spring, Maryland, Mississippi’s Stennis Space Center Coastal Development Center and the Cooperative Institute for Ocean Research and Exploration at Harbor Branch, Fort Pierce Florida. 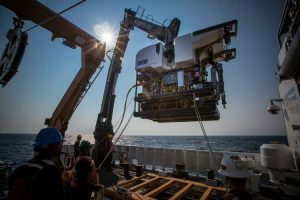 These centers have a direct link to Okeanos, allowing for seamless communication and transmission, and quite literally bringing land lubber scientists aboard one of the planet’s most state of the art research vessels. 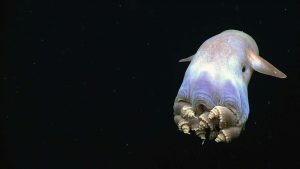 Expeditions: Already this year, the Okeanos has led deep-water exploration of the Marinas Trench, the deepest known point in the world’s oceans. 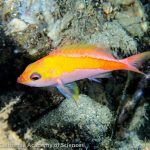 Also, the ship has mapped the Pacific Remote Islands National Marine Monument, which consisted of 24-hour long mapping operations. 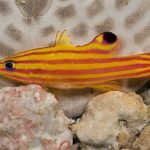 Earlier this year Okeanos explored deep waters off the coast of Hawaii, which focused on the underwater mid-Pacific mountain range. NOAA has kept a detailed catalogue of past year’s missions, and offers a host of HD videos and breakdowns of scientific findings for the general public. To tap into the treasure trove of information uncovered by the Okeanos, click here.